The Irish Dairy Board’s (IDB) Production Price Index (PPI) for November was down over 2.4% on the October return remains at its lowest level since August 2012. 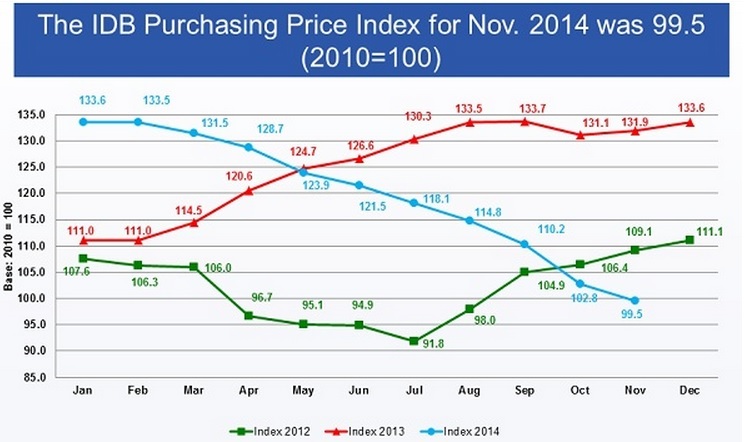 The Index has fallen for the past 10 months, with falls over that period totalling over 25%. This follows on from a fantastic 2013 for dairy returns, with the Index having only fallen once in 2013. November’s result is also some 24% behind the same month last year. The result comes on the back of prices paid at last week’s Fonterra dairy auction being down by 1.1%, compared with those recorded at the event held late last month. The IDB released its monthly PPI this week and it showed a return value of 99.5, which indicates a 0.5% decrease in market returns when compared to 2010. January 2013 saw the Index at 111 and it then rose significantly over the spring and summer months peaking in September 2013 at 133.7. It is now over 25% of that high.